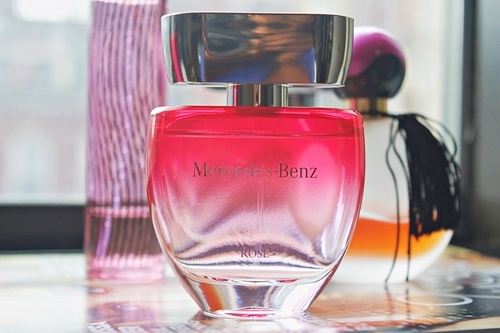 Alluring, dreamy, enticing, exotic, and feminine; these are some of the words I will choose to describe the 'Rose' perfume by Mercedes-Benz - Yes, you heard right, Mercedes-Benz has a women's fragrance line and men's cologne line. Up until now, I had no idea Mercedes-Benz had a fragrance line. The idea behind their fragrance line is to put the "new car smell" in a bottle; As cute as that may sound, I honestly don't think I want to be walking around smelling like the inside of a new car haha. With that being said, their 'Rose.' Perfume smells as lovely as a starry water. My goodness, the scent reminds me of having an afternoon picnic is a rose garden by a lake somewhere in a remote countryside. Mercedes-Benz knew what they were doing when they put together the 'notes.' for this fragrance. It has a clean and airy scent, not too overpowering and not too subtle. It has just the right amount of 'smell payoff,' not the kind of scent that will give you a headache nor the kind of smell that dissipates off your skin after twenty minutes. The lemon scent is picked up as soon as you spritz the perfume on your skin. The black currant scent is also picked up with a whiff of the rosewood - As the fragrance continue to wear, you will begin to pick up the amber, cedar, and white musk scent. I love the clean, delicate, light, and earthy smell of white musk, so this perfume is a win-win for me. Launched in 2015, Rose from Mercedes-Benz is a modern feminine fragrance that boasts of primarily floral and citrus scents. The top notes for the feminine fragrance consist mainly of lemon and black currant. At heart is a floral mix of creamy rosewood and elemi shades, which are further complimented by woody notes at the bottom such as white musk, amber, cedar, and rosewood. Here Is A Small Jist About One Of the Luxury Car Companies In The World. And How They Branched Out Into Making Accessories. The famous automobile company decided to reach out to fashion and fragrance territory and launched the Mercedes-Benz accessories in 2012. The luxury car manufacturing company offers accessories in the form of luxury eyewear, furniture, leather and luggage, fragrances, and other luxury goods. Benz aims their products at the style conscious customers and has made a unique niche with their perfect expression and execution of modern luxury. With a high brand value in the market, Benz aims at creating high quality in each and every detail of the product. Mercedes-Benz created a vibrant and sophisticated perfume for men and presented it to the world in a sleek flacon which is both masculine and contemporary. I got my perfume from Fragrance Market. An online perfume outlet that sells high-end designer fragrances at an affordable price. Fragrance Market is one of the nation’s largest and trusted online retailers of genuine designer fragrances and related accessories. They carry over 3,000 original, brand name fragrances, skincare, makeup, haircare, all at discount prices. They carry the most popular names in fragrance including Calvin Klein, Lacoste, Escada, Hugo Boss, Carolina Herrera, Paco Rabanne, Michael Kors, Thierry Mugler, DKNY, Coach, Davidoff, Vera Wang, and many other in-demand luxury brands. Fragrance Market is proud to be a purveyor of the finest women’s perfume and men’s perfume and fragrances that are sold at a great value. Fragrances can cost a small fortune when purchased at most department stores, but not with Fragrance Market Because they substantially mark down their fragrances, you get more for your money. 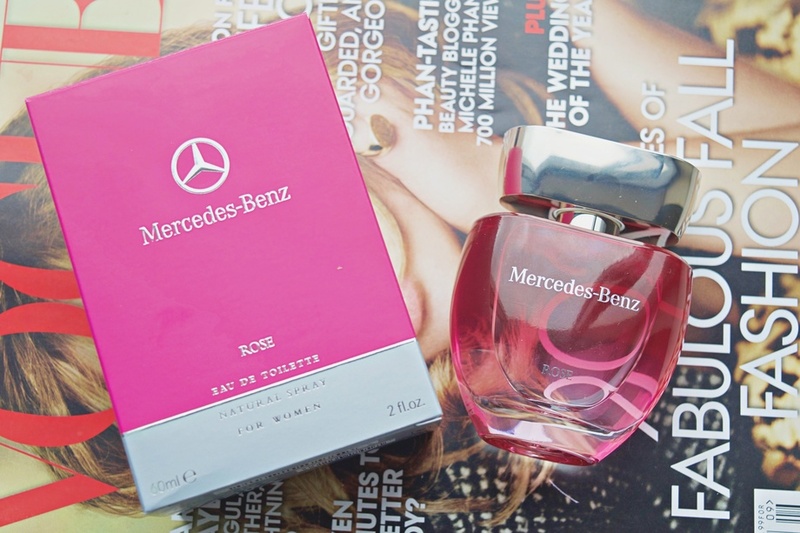 ** This post is in collaboration with Fragrance Market for Mercedes-Benz. All thoughts and opinions are my own. What a cool concept for them to make a perfume. I'd love to give it a sniff! I really want to smell this perfume now! You will love this perfume. It is light, airy, and subtle.